On Thursday morning, I headed from my hotel in Shinjuku to Ginza for lunch at Iwa. I've visited Iwa before, and have written at length about it here. It's one of my favorite sushiya and so I was very happy to be visiting again. Iwa was forced to move last year. The owner of the building they were located in decided to completely renovate the space before the 2020 Olympics, and so the restaurant moved to another building located directly across the street. The great news is that second in command Tsunoda-san will be getting his very own counter in a couple of months. Currently, a single counter on the ground floor sits six customers, but they are building another bar in the basement of the building which Tsunoda-san will man. It was great to see chef Tsunoda again, he recognized me from my last meal with him in 2014 and we had a nice chat. He's a warm and lovely guy. On this particular visit though, Iwa-san was behind the counter. The only other customers were three Japanese ladies, and so the four of us had chef Iwa's undivided attention. Talk about an intimate lunch setting! I decided to opt for the 13 piece nigiri lunch set priced at ¥8,000. 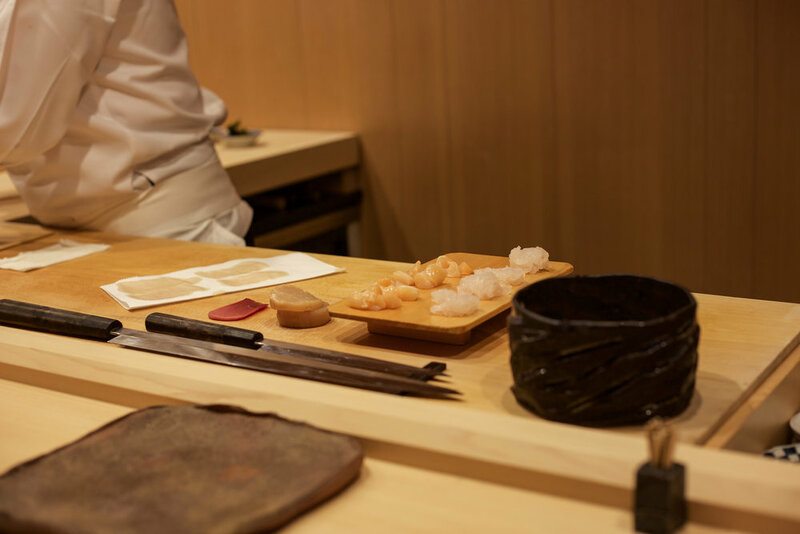 Other lunch options include a 10 piece nigiri set for ¥5,000, or a full "omakase" meal with otsumami for about ¥22,000. I found Iwa's rice to be even better than before; more aggressively seasoned with akasu, and very slightly warmer in temperature than on previous visits. It was really perfect. I personally would have liked just a little more rice to be used for each nigiri, but this is a very minor nitpick. Overall, Iwa's sushi is balanced and delicious. It remains one of my favorites. The nigiri served included karei, suzuki, tai, kinmedai, maguro zuke, chutoro, shiro ebi, kobashira, hotate, aoyagi, shirauo steamed in sakura leaf, and anago, in that order. A kanpyo maki and sakura ebi maki completed the meal, and I also added an order of kohada at the end. Everything was delicious, but particular highlights for me were the karei, aoyagi, shirauo, and sakura ebi maki. Below you will find photographs of the lunch, in the sequence served.